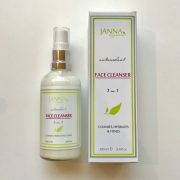 Janna Organic is a family owned business with the purpose of improving your beauty, health and lifestyle. 09 June 2014. The day Janna Organic came to life. Situated in the heart of London, Janna Organic comes with a wide selection of unique and special organic products and 20 years of professional experience in this field. Our passionate belief is that health & beauty should be natural & organic. No chemicals, no synthetics, no harm. Our beliefs lie in nature, transparency & customer satisfaction. We believe you have the right to know what goes inside the products you purchase. Our vision is to bring our expertise & experience to the hand of our valued customers in the health and organic communities. Today, awareness and interest in natural remedies, organic health, skin & body care are on the increase. Our range of non-synthetic products reflects our values deeply. Those values include the protection and preservation of our finite environment and the health and goodness of your own body. We provide products for all types of people of all ages and we are here to look after you. Made with love. Janna organic.